Tokushima Familyland is one of the tougher Japanese parks to get to, as it is located in a remote part of the country that is not well served by public transport. We walked there from Jizobashi Station, a three quarter hour stroll only possible thanks to a GPS watch and pre-planned waypoints. Mobile phone coverage in the area was patchy at best, which prevented use of Google Maps, and there were no shops of any kind on the route. Google Street View shows a taxi waiting in front of the station entrance, but there was no sign of one today, and without a working telephone there was no obvious way to summon one either. We arrived at the park about half an hour ahead of opening, but the gate was already open and nobody disturbed us as we walked around. The place remained largely empty even after the covers came off the ticket machines, and the various operators were thus keeping themselves occupied with general cleaning and maintenance tasks. They were extremely attentive, however; every time we walked towards a ride someone would come running over to press the appropriate buttons. They were evidently delighted (if somewhat bemused) at having two western visitors in their midst, and were doing everything they could to make sure we had a day to remember. The first coaster of the day became Junior Roller Coaster (#2179), a clone of the ride we'd ridden a few days before at Shibukawa Skyland. This unit was in showroom condition, unlike its brother, with recently repainted track and a ride quality that was above average for a Roller Skater. We completed two laps, one in front and one in back, and the friendly ride operator offered to take our photograph even though he had to climb across the track to get the angle he wanted. We went from there to a Mad Mouse (#2180) of indeterminate provenance with a layout that looked at first glance like it might have been designed by someone with obsessive-compulsive disorder; the track segments were placed equal distances from each other, and the overhead profile looked like something I might have produced as a teenager in my technical drawing classes. The ride started out with the Heimlich manoeuvre as the single seat car engaged the lift hill, but aside from that the ride was great if somewhat involved, delivering strong forces in every turn. There was no shortage of leg room, and once again we decided to ride twice. The park has a relatively understated BFOFW, at least by local standards, with just twenty-four cars. Two of them were made out of completely transparent fiberglass, and the operator was insistent that we should wait for one. This was a neat experience, and while the best photos were had through the window we managed a handful through the floor too! Washuzan Highland is located a brisk thirty minutes walk from Kojima Station, though readers should be aware that much of the journey is uphill. We decided we'd save energy (and time) by using a taxi, and thus we arrived at the park entrance shortly before 2:30pm. We'd scarcely taken two steps from the car when we were spotted by a group of teenaged girls who asked us to pose for a photograph with them; apparently they'd never seen someone quite so tall before. Given how excited they were it would have been churlish indeed to refuse. It was immediately obvious to us both that the credit we were most looking forward to was closed. 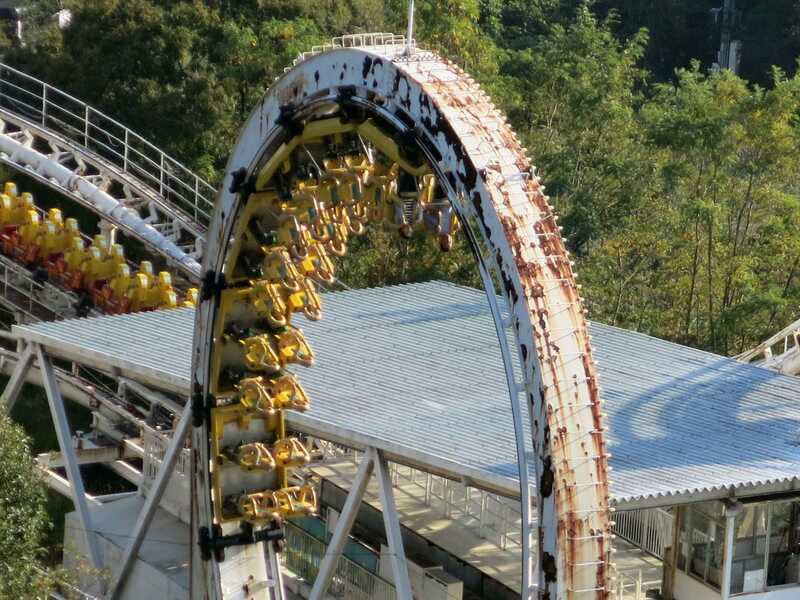 The three decade old stand-up coaster stood forlorn above the entrance pathway, its track covered in rust. If I'd been at the park on my own then I'd have changed plans on the fly, as I did in 2011, but this was Megan's first trip and given that we decided to proceed and headed for the ticket desk. The staff member on duty spoke only rudimentary English, but pulled out a map and drew big crosses across several closed rides, including Chupy Coaster. It looked very much like HRH was only going to get one of three possible credits, and she wasn't pleased at all. Nevertheless, we walked into the park and immediately went to have a look at the stand-up coaster. The rust-covered track, which had looked bad from a distance, looked positively terrifying up close. However, against all expectations, the chain lift mechanism was rotating slowly. There was no barrier in front of the station, and given that we clambered up the stairs to discover that Star Jet (#2181) was ready to board. Two locals were already in the front car, and given that we decided to select row three, each of us offering up our own private prayers for a safe return to the station. As it turned out, however, we need not have worried; the ride that looked like an accident waiting to happen (like Expoland) proved to be unexpectedly brilliant, delivering airtime, good laterals, and absolutely no headbanging. We decided against riding a second time (why tempt fate?) but were impressed by what we'd experienced. Ultra Twister was wearing fresh paint, with white supports and pale pink rails. Only one of the four cars was in use today, though there was no queue at all so one can hardly blame the park for that. Eight years ago my trip report stated that this ride hurt, but without giving any specifics, and given that I decided to brace for impact as the train crested the vertical lift. I need not have bothered, though; the first drop was smooth with a vague hint of airtime, and the bunny hop and heart line roll that followed were negotiated effortlessly. My old report seemed excessively critical for a few glorious seconds until we hit the block brake section, which featured three separate mechanisms; the first two were bearable, but the third was a brutal slam that hit back, shoulders, and neck with a violence that should not have been possible for a vehicle that by that stage was moving at no more than two miles per hour. The subsequent heart line rolls were pleasant enough, but the bruising from the earlier stop meant that there was no way I was going to ride again. We climbed the three hundred and fifty-four steps to the top of the mountain (yes, I counted) to the BFOFW, a particularly large example with forty-eight cars and an absolutely amazing view. The windows hadn't been cleaned in some time, unfortunately, but there was enough room to push a camera around the side of the door for obligatory overhead photographs. We were walking across the top section of the park when we abruptly heard the mechanical noises associated with a chain lift starting up, and moment later an empty Chupy Coaster train trundled past. We ran towards the boarding station just in time to see two mechanics in overalls walking away, and to our delight they had been replaced by a ride operator. 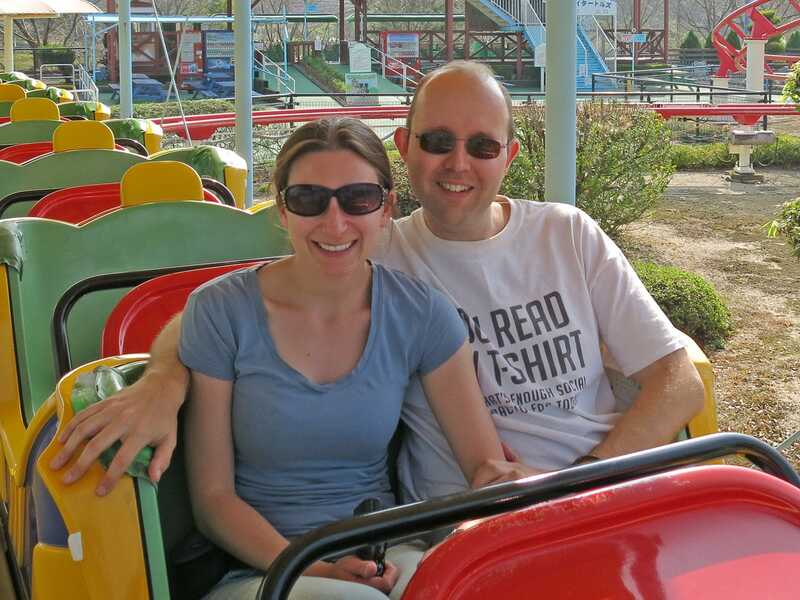 The layout of the ride was jet coaster undistinguished, but despite that we enjoyed it enormously, our enthusiasm evidently boosted by the fact that we'd not expected to be able to experience it all. We managed two laps, one in front, one in back. We also took the time to ride a full size S&S Turbo Drop, installed in a location that made it feel far bigger than it actually was. The visual effect was not dissimilar to that of the Big Shot, though amplified considerably by an agonisingly slow climb to an apex that seemed like it was thousands of feet in the air. The programme in use today was not an aggressive one, with a gentle dropping sensation rather than the abrupt pop of air that some of these towers deliver, but despite that the screams we heard from the normally reserved locals were memorable indeed. The park has a fairly elderly Cycle Monorail that has been doing the rounds on Facebook in recent months, accompanied by a caption asking would you ride this. The condition of the track didn't inspire much confidence but the view made it difficult to resist, and thus we boarded. It was immediately obvious that I was once again to tall to pedal, but Megan was able to take the strain, stopping at all the appropriate moments so we could capture images of the rusty coaster track nearby for posterity. We were on our way back to ground level when we noticed that the stand-up train on Star Jet had been parked, and a backwards-facing sit down train had been put into operation. We decided that it would be rude not to ride, and once again we were treated to a smooth and fun coaster that handled far better than its visual appearance would suggest. We learned subsequently that there is a daily schedule for rotating between train types; as of this writing, the stand-up train is used between 13:00 and 15:30, and the sit-down train is used at all other times.